The struggle for control of Venezuela turned to the military, as supporters of opposition leader Juan Guaido handed leaflets to soldiers detailing a proposed amnesty law that would protect them for helping overthrow President Nicolas Maduro. The standoff has plunged troubled Venezuela into a new chapter of political turmoil that has already left more than two dozen dead as thousands took to the streets demanding Maduro step down. It erupted when Guaido, the 35-year-old leader of Venezuela’s opposition-controlled congress, declared before masses of supporters last week that he has temporarily assumed presidential powers, vowing to hold free elections and end Maduro’s dictatorship. Venezuela’s crisis came before the U.N. Security Council, which took no formal action because of divisions among members. Russia and China back Maduro. But France and Britain joined Spain and Germany in turning up the pressure on Maduro, saying they would recognize Guaido as president unless Venezuela calls a new presidential election within eight days. 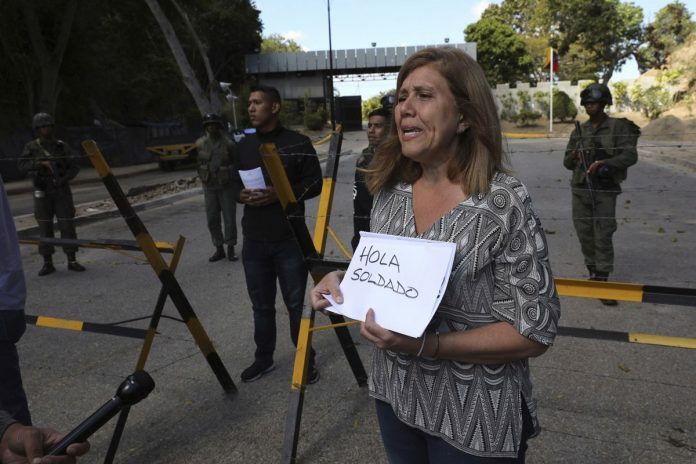 Guaido’s supporters made their case directly to soldiers on Sunday, handing them leaflets that urged they reject the socialist leader and explaining how they could be eligible for amnesty if they help return Venezuela to democracy. In claiming residential powers, Guaido said he was acting in accordance with two articles of the constitution that give the National Assembly president the right to hold power temporarily and call new elections.